People run for many reasons. Among the most common reasons are: (1) because they can, (2) because of the feeling of freedom, (3) because they get to challenge themselves, and (4) just for the enjoyment of it all. More recently, now at any road race or fun run you attend you will see that many people are also doing it to raise money. “It is for a good cause.” This has been an innovative money spinner for many not-for-profits, and why ought they not to benefit? It is a good thing. This is an important question because of the magnitude of child mortality alone. If the entire Australian cities of Sydney and Perth were completely wiped out this year, it would be a figure less than the number of children under the age of five who will die this year alone. That is just wrong. Worse, many of the deaths are from preventable disease. The running is to raise awareness. It is not a ‘charity’ run in itself. It is seeking to create social impact by opening a conversation where best practice can be gathered and then shared, especially to the people where it matters most. Note that this is a difficult problem. A lot of people with money can fly to New York and have the same conversation, and a lot of good will come from that. My sense is that in some cases the problem remains unabated. This is my point: we need to improve our capacity for delivery. The outcome is all important. Designing a ‘wellbeing-wiki’ to help those most in need to improve the delivery of child survival. A series in Design Forum in each city visited (along with gathering advice and information from around the world) will shape out capacity to find best practice, and determine how this is best shared. It is the running that opens this conversation. That is why in this case running is important. That is why in this case it is running for a cause. 2.4 km: A highly participative run to engage groups in different locations running the same distance. This idea to involve collage students across the world came from a conversation from my running coach Bob Williams. While 100 people running 2.4 km in under 30 minutes illustrates that many people coming together can run the distance I will travel across 10 countries, there is a more meaningful symbolism here. ‘2.4’ is an approximation of the number of under-five deaths to be reduced before 2015 to meet the Millennium Development Goal. 2.4 million. The focus is to run this in mid-September from New York ahead of the United Nations General Assembly which is coincident with what I have called ‘Mortality Overshoot Day’: the date in 2013 when we as a global community exceed the number of child deaths aimed for in 2015. 24 km: the 10 City Bridge Run is organised with 10 sub-marathons each of 24 km run in 10 cities across 10 countries. ’24’ relates to the mortality rate from 2008 which in 2010 (when this idea was hatched) was the cited figure for child mortality. The good news is that we are making progress. Hans Rosling, the avuncular statistician, has even demonstrated that it might be possible yet to achieve the Millennium Development Goals. The 10 countries where the running will occur are among those where child mortality is at its worst, or where the capacity to leverage child survival is at its best. Marathon (42 km): This is the reason for this blog. There are two wonderful women both called Zipporah in this story, both from Kenya. My Facebook friend Zipporah back when I first announced the countries to be run asked why didn’t I have more focus on Africa. That has since changed. The second Zipporah is a friend I met on the recent Commonwealth Study Conference. She was very insistent that I go to Kenya and invite runners from elsewhere in Africa and the world to join us there. I have been encouraged by other friends, such as John Thuo also from Kenya. During all of these conversations, what emerged was the idea of finishing the 10 City Bridge Run off with a full distance marathon in early March 2014. It is a way of celebrating: celebrating the completion of the 10 City Bridge Run journey, celebrating progress made in improving child survival, and the running community celebrating a sense of unity coming together to make a difference. It would have a proposed international entry. The question this blog seeks to have answered is whether it is desirable or necessary to run a full-length marathon? Wouldn’t it be less trouble and make more sense to complete the 10th leg as also a 24 km distance? And yes, there are a lot of questions to which we don’t have answers. There has been some excellent discussion and contribution, and the reason for this post is to put those questions on the table for everyone to talk about and pick apart. We want to hear your thoughts. Good ideas, bad ideas, trouble and problems. Also opportunities. 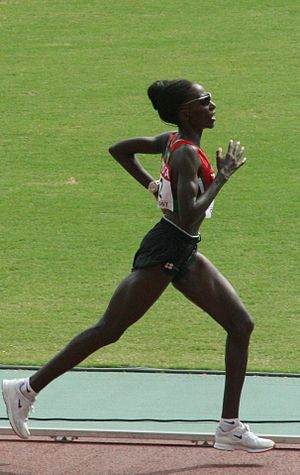 Is running a marathon in Kenya in March 2014 achievable? Noting the additional marshals, distance and logistics, would we be better to run a 24 km distance instead? It might make more sense to keep the 24 km distance: less stress on athletes who might be training for other races, less burden to organise. The only real advantage of keeping the marathon is that Kenya and other countries in Africa are well known for their runners across marathon distance. I think we could safely kill off the marathon, and still uphold the spotlight on African athletic reputation. Let’s come to a decision quickly! Where is the best city/village in Kenya and route to chose? This will obviously depend on the length. Again, 24 km makes all of the organisation much easier. If the run was across 24 km, it would be a ‘challenge’/’fun run’, but not a championship race as very few other runs cover this same distance. What are your thoughts as to the purpose? What prizes structure would be best to organise? This will impact on how sponsors are approached, and this will be affected by our relationship by organisation with Kenyan Athletics. Again, there are some first order questions to be addressed: distance, location and purpose. Once these are addressed, we can open a more meaningful conversation with sponsors and Kenyan Athletics. So there is a lot of work to do. I just looked at the Marathon 2014 website and something caught my attention. I believe it speaks to the unequal distribution of focus which itself directly impacts our ability to understand what poverty is and its impact. In 2014, there are zero marathons planned to be run in Kenya according to the site. I don’t know if this is correct, and I haven’t asked Toby Tanser about it. But it is interesting to note that in the US or UK or even Australia there are a wealth of marathons people can attend. To end, one last comment. Let’s not reinvent the wheel. We are part of a global running community, and should all help each other. If there is an existing race that this can be part of, or if we can partner with someone to make this easier to organise, then let’s talk about how that is possible. There is a particular focus to what we want to achieve here, in improving the delivery of child survival globally. But let us be open to what each other has to say. Harambee! This entry was posted in 10 City Bridge Run, Kenya, Marathon and tagged Child survival, Hans Rosling, Kenya. Well done Pathfinder! I think this is clear and well written and has taken a lot of thought and courage. A huge topic to choose and continue to ‘run’ with, pardon the pun. I also think that the 24km run to finish would be the better choice, because as you suggest, the organisation could be easier; and possibly the focus on the conversation might not be confused by the actual run. Yes, good advice about 24 km. For many reasons, some of which you mentioned here. Race marshal? You are hired! Thanks Mum.